Sitel is a business processing outsourcing (BPO) firm that employs 57,000 people in 25 countries across North America, South America, Europe, Africa, and Asia. Most of those employees are onsite employees, however the company does have a work-at-home call center division for U.S. residents. Sitel hires home-based employees who take inbound customer service calls for its clients. Agents may provide service in billing, account inquiries, product orders/inquiries, installation scheduling, or technical troubleshooting. All positions involve some sales. Bilingual candidates are always a plus. The company looks for applicants fluent in English, French, German, Italian, Korean, Mandarin, Portuguese, and Spanish. Offering both part and full-time schedules, Sitel expects all agents to commit to working the same 5-day-a-week schedule (which must include at least one weekend day). A full-time shift is 6-8 hours (or 30 to 40 hours a week), while a part-time shift is 4-5 hours (or 20 to 25 hours weekly). Unlike many home call center companies, Sitel hires agents as employees, not independent contractors, and offers benefits. Benefits include medical and dental benefits for full-time employees, 401(K), vacation and holiday pay, and employee discounts with Sitel's clients, which include consumer electronics companies, PC manufacturers, satellite service providers, and mobile communications companies. Training is full-time (40 hours/week), at home and paid. It lasts one to six weeks depending on the position. Sitel pays an hourly wage—something not all call centers do. According to Glassdoor.com, call center jobs at Sitel pay around $9.50 per hour. Keep in mind that Glassdoor's salary information does not make a distinction between on-site and work-at-home call center jobs. While the company outsources globally, Sitel Work@Home only hires in the United States in the following states: Alabama, Arizona, Colorado, Connecticut, Delaware, Florida, Georgia, Idaho, Illinois, Iowa, Kansas, Kentucky, Louisiana, Maine, Michigan, Minnesota, Mississippi, Missouri, Nebraska, Nevada, New Jersey, New Mexico, New York, North Carolina, Oklahoma, Pennsylvania, South Carolina, South Dakota, Tennessee, Texas, Utah, Virginia, Washington and Wisconsin. Don't see your locations? Check out call center jobs by U.S. states or call centers in Canada. To find a call center job here, go to the Sitel jobs web page and click "Sitel Work@Home" to submit an online application. Applicants must have a high school diploma or GED and be legally able to work in the U.S. Prior customer service experience is preferred. There are no fees associated with applying to or being hired by Sitel. Agents must submit information for a criminal background and credit check and submit to a drug test, but Sitel pays the costs. However, like any home call center job there is the cost of maintaining a call center home office. 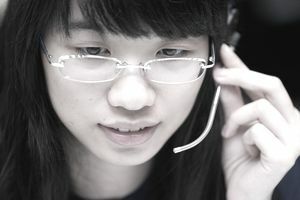 Sitel's requirements are in line with the typical home office requirements for a call center agent. Agents must own (or purchase) a desktop computer (no Macs) and have an Internet connection (DSL or cable) and a landline phone (no VOIP or cell). Once hired, agents must purchase a specific type of phone and headset. The application asks for basic contact information, education level, and work experience (allowing you to add brief descriptions). It is submitted online and then, if an applicant meets the qualifications, he or she is emailed an online assessment, which must be completed within 24 hours.